I was at a wedding a couple weeks prior to my company event and they had a photo booth and everybody seemed to really enjoy it. So I took a chance and brought one on a boat for our companies 20th anniversary. It was the best money spent at the event!! Everybody loved it and days later I was still getting told by people how much they enjoyed the pictures they got and the entertainment it provided. They arrive on time and all set up and the attendant was very friendly and a pleasure to do business with!! BoothMN did an amazing job at our wedding! Everyone loved it! We had two strips printed out each time. Our guests kept one and they took the other and put it in a scrapbook! I love how it turned out! Will consider using them again for other events! Thank you for the fine job that you did at Kim and Charlie's wedding. You made the photo booth picture taking a smooth process. We were very pleased. I've never experienced a photo booth before, wow was that fun, guest commented how it was the best that they've experienced, the staff was fun, professional and courteous!! I recommend them to anyone. Was very happy with their service. Were willing to do what I asked and allowed for professional feedback and what ideas would work and not. We had a photo booth and everyone had a blast!!! We just wanted to thank you and the guys for all of their hard work yesterday! They made things flow so well and even dealt with my craziness. AMAZING! They made our wedding so much fun and we have received so many comments regarding how fun the photobooth was, a great thing to have!! Thanks again! Thanks so much for helping us celebrate our special day. The Photo Booth folks were awesome! First class all the way! We used BoothMN for the photo booth. They made it easier to share our pictures with friends and family. 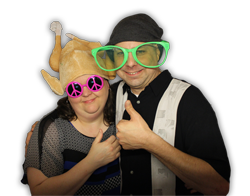 I was hesitant to do the photo booth at first but I am glad that we did, everyone had a lot of fun with it. The owner had a lot of good suggestions ahead of time and was well prepared as well as flexible with any last minute ideas we had, you can tell he has a lot of experience with weddings. We used the photobooth service and loved it. The photographers were a lot of fun but yet professional. Our photobook is priceless! The owner was very responsive to emails, finding songs for us and answering all questions we had. We highly recommend BoothMN photobooth service. They made a very fun event for our guests. Things went great! I got the CD in the mail and the photos are great. Thanks so much for a great night! The photo booth was perfect and added a special touch to our wedding!! We wouldn't have changed anything!! We couldn't have had a better night!! Thanks!! Just some feedback from yesterday. HUGE SUCCESS!! Our folks want to know how soon you can come back to do it again! It was a great photo shoot and your team did an amazing job! I look forward to working with you again. We had a wonderful experience with the photo booth. The pictures turned out great and our guests LOVED that there was space to have a lot of people in there all at once. The props were also a total hit with the crowd we had. We put all of the pictures into an album and every time we look through it we catch a different funny thing about it. We had people from 10 years old to 96 years old in it and everyone had a blast! BoothMN Performed at our Prom and were tons of fun! Everyone loved the props and the people were great to work with! A big hit and were very affordable! It was a huge hit! The quaility of the pictures were great and it was awesome that someone was in there taking the pictures, it wasnt some tiny photobooth. Suzy did a great job with the photography!